When water flows into your home or property, it doesn’t seem like there’s much to it. There’s a pipe, and it brings water when you turn on the faucet. Simple, right? Well, it only seems simple when proper backflow prevention safeguards are in place. Your relationship with water gets a lot more complicated when you consider the fact that water going the opposite direction can be a huge hazard. We’ll explain what “backflow prevention” really means and why it’s so important to get the OK from certified backflow prevention experts. Any water that comes out of a faucet or pipe in your property is considered “on its way to the sewage system.” In other words: that water is now contaminated, and it must go to the sewage system. However, it is possible that contaminated water can make its way back from where it came. When this happens, it’s called backflow, and there’s a big risk of contamination or toxicity. The reason this would happen is because drainage systems rely entirely on gravity. If the water isn’t flowing downhill at all times, it can back up. If your home or property is lower than the attachment to the municipal sewer line, it can result in backflow. Backflow prevention refers to the services that keep clean water from being contaminated from backflow. It involves devices that exist purely for this purpose, but they can only be tested and installed by certified professionals. 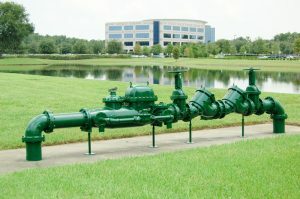 What Goes Into Backflow Testing? Surveys that ensure the property owner’s use of water doesn’t threaten the water system with contamination. That includes, but is not limited to, inspecting the plumbing system to see that it meets the highest safety standards. Any problems identified must be corrected, or measures must be taken to prevent backflow. Fixing backflow issues is not optional, as it can have detrimental effects on the public water supply. Regularly scheduled inspections are necessary to ensure that the backflow prevention measures are still effective. Who Is Allowed to Get Certified? Backflow prevention and testing is never a job for an amateur. An uncertified individual can put the city’s water at risk by failing to identify contaminated water, or by incorrectly installing a backflow prevention device. Laws vary by state, but it’s often required that an individual renew their certification every three years. This ensures that they’re always up to date with the latest in backflow prevention safety. Without it, they are not permitted to install backflow prevention assemblies. Luckily, we’re your local Deptford Township, NJ plumber, fully certified in backflow prevention and testing. We know that backflow prevention problems aren’t just an inconvenience—they’re emergencies. Our fully–trained technicians can handle all aspects of the job, from the initial planning to the final quality check and inspection. For backflow prevention certification and testing, contact SPS Mechanical Inc. today.